Welcome to the October edition of Arcadia Electrical Company's newsletter, Energy Minute! As always, we look forward to working with you! 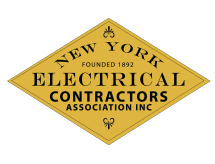 The next NYECA General Membership meeting will be held on Tuesday, October 13th, at 4:30PM at Tiro A Segno, 77 MacDougal Street, New York, NY 10012. At the meeting, NYECA will be featuring a guest speaker who will discuss compliance reporting requirements pertaining to the Affordable Care Act (ACA). As part of the 2016 ACA's "Employer Mandate / Employer Penalty," business owners may be subject to audits and excessive penalties for non-compliance. The guest speaker will be addressing these issues and informing members how to best manage their practices to comply with the upcoming ACA regulations. For general inquiries, please call (212) 481 0530. 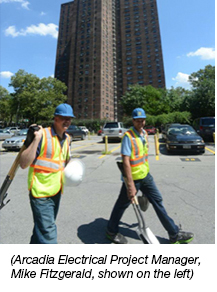 Arcadia Electrical and others break ground on new LED lighting at the Polo Grounds Towers in Harlem. City officials have committed nearly $80 million to upgrade lights at 15 public housing developments red-flagged last year because of high crime. However, while the LED lighting systems are drastically reducing crime in those housing developments, crime is now being diverted to the areas immediately surrounding those developments. On Tuesday, Michael Harrington, Deputy Chief of the NYPD Housing Bureau, confirmed the department is reevaluating the list of 15. Harrington said this as NYCHA Chairwoman Shola Olatoye, speaking at the Polo Grounds Towers, where crime is down 19%, announced the focus would stay on the targeted 15. She said the nearly $80 million would go for improved lighting and other security upgrades at the developments through next June. This past April, an initiative to increase the number of trained solar workers in the United States was announced by the U.S. Department of Energy (DOE). Their goal is have 75,000 people enter the solar workforce by 2020, with a specific focus on veterans to help military personnel, to give the U.S. economy and job growth a huge boost. 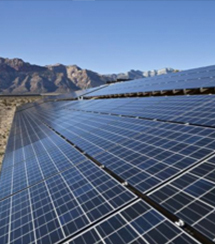 The Solar Energy Industries Association (SEIA) already employs 175,000 workers nationwide, pumping nearly $18 billion a year into the economy. The Solar Instructor Training Network (SITN) is a network of 400 partnering community colleges that have trained over 1,000 certified solar instructors and 30,000 students nationwide, allowing the solar industry to add jobs 10 times faster than the rest of the economy. The Interstate Renewable Energy Council (IREC) is partnering with nine SITN regional training providers and other industry professionals to develop a qualified solar workforce that matches training with evolving industry needs. Even public opinion has increased favor for solar energy over natural gas, oil, coal, nuclear and other renewables, indicating its rapid growth. The release of a new line of stationary rechargeable lithium-ion batteries for homes and commercial buildings was announced by Tesla Motors this past April. A unique design feature allows them to store energy when other options are unavailable or too expensive. The battery costs $3000 for a 7-kilowatt-hour (kWh) version and $3500 for a 10- kWh, not including installation or required direct-current-to-alternating-current inverter. Each battery comes with a 10-year guarantee and some integrated software that provides thermal regulation, safety checks and energy optimization. 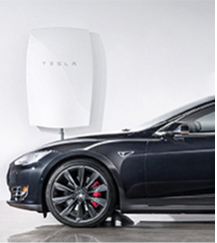 The batteries also connect to the Internet, allowing Tesla to create smart microgrids. Tesla wants to fundamentally alter the way people use energy at the terawatt scale and transform the world's entire energy infrastructure. 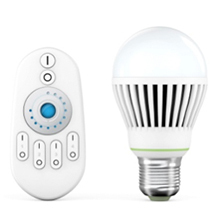 Light-emitting diodes (LEDs) are taking on a widening role in the race for greater energy efficiency as they quickly displace florescent and incandescent lighting. Modesto, California is using LEDs for large, categorical energy uses as an opportunity for big gains in efficiency. They launched the Citywide Light Emitting Diode Streetlight Conversion Project to replace approximately 9,500 high-pressure sodium (HPS) streetlights with LED fixtures, potentially saving $500,000 in energy costs per year. Municipal lighting specialists confirm the trend of cities converting to LED streetlights, however there is still a long way to go. Although dozens of cities from across the country have already made the transition for tremendous potential gains in efficiency and cost savings, a majority of local governments are still slow to embrace the technology. There have been great advances for the wind power industry in the past few years; however it still has great room for expansion. In a recently published study with a collaborative examination of future scenarios, the U.S. Department of Energy (DOE) states much potential for the wind-power industry. 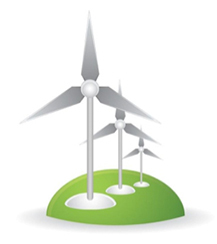 According to the DOE, the nation currently receives 4.5 percent of its electricity from wind, with potential to grow 10 times greater the current demand. The potential impact of wind-power can eventually save electricity costs by 2 percent by 2050 because of a steady lowering of costs for wind-power technology and lesser demand for other forms of energy due to the increased diversity. Other benefits include 600,000 wind-industry-related jobs across the country, increased profits for farmers and landowners from land leases for wind farms, and 25 percent reduction in water usage by the electric industry.